You’ll be hard-pressed to find a training program that doesn’t utilize supersets, tri-sets or giant sets. In many cases programs will contain all three -- for good reason! But are they right for you and your goals? Supersets: Completing two exercises back to back with little to no rest. Tri-sets: Completing three exercises back to back with little to no rest. Giant sets: Four or more exercises back to back with little to no rest. You can either pair exercises that are noncompeting (i.e., work opposing muscle groups), or you can pair exercises that target the same muscle group. The biggest benefit to pairing exercises is time efficiency. In the classic method, you will complete all of the scheduled sets of one exercise before moving to the next, resting for a period of time in between sets. A large portion of your session would be dedicated to rest. With supersets, tri-sets and giant sets, the rest period is used to complete a set of another exercise. This allows you to complete the same amount of exercises in a much shorter period of time. Another benefit of pairing exercises is the increased density. This results in a level of fatigue and metabolic stress, creating a favorable hormonal response, which may lead to greater muscle growth. The more muscle you have, the more potential for future strength gains as well as a greater amount of metabolic tissue, which requires more calories -- all good things if your goal is to gain some muscle and lose some fat. So with all of the benefits that come from supersets, tri-sets and giant sets, it seems that these methods are the right approach for everyone, right? But it’s a little more complicated than that. If your main goal is to get as strong as possible in the shortest amount of time, moving away from supersets for the bulk of your program is recommended. The increased levels of fatigue that result from the pairings will limit your ability to express force. A decreased force potential will reduce the amount of resistance you can use and will limit your strength gains. Even if you were to utilize the opposing muscle group pairings, the systemic fatigue resulting from the accumulated work will compromise the central nervous system, decreasing your ability to produce force. If strength is the goal, dedicate your sessions to performing most of your exercises in the classic fashion. You can still use the rest periods to perform low-level correctives, but pairing two or more fatiguing exercises back to back is not recommended. If your goals include strength gain, muscle gain and fat loss, there’s a way you can use both the classic method along with supersets, tri-sets and giant sets. For each session, dedicate your first one or two exercises to strength, and complete them in the classic fashion. I would still recommend performing low-level corrective exercises during your rest, but nothing that will create fatigue. To target strength, complete three to six sets of six repetitions or less, with two to five minutes of rest between sets. 1a) Trap Bar Deadlift: four sets of six reps with three minutes of rest between each set. 1b) Wall Slide: three sets of eight reps performed during the rest period. 2a) DB Alternating Bench Press: three sets of six reps per side with two minutes of rest between each set. 2b) Ankle Mobility: two sets of eight reps per side during the rest period. 3a) DB Reverse Lunge: three sets of eight reps per side. 3b) Single-Leg Push-Up: three sets of six reps per side. 3c) Band Triceps Push-Down (with pause at the bottom): three sets of eight reps.
For 3a, 3b and 3c, you will go from exercise to exercise with as little rest as possible. 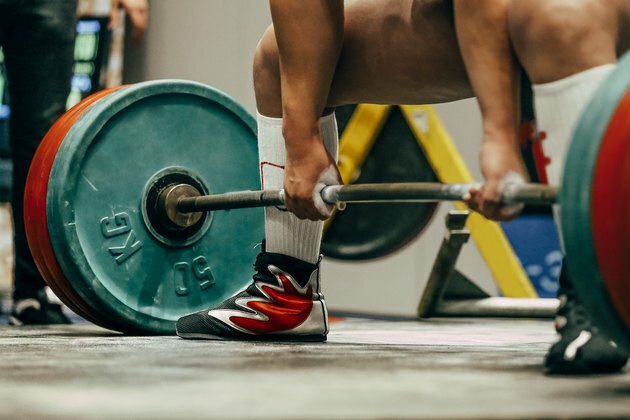 Pairing exercises is a great way to increase time efficiency and muscular growth, but when it comes to gaining strength, pairing exercises is likely limiting your results. When you are looking to gain strength and muscle and lose some fat in the process, try the above method to take advantage of both the classic and pairing methods.